Take a break from the grocery store and make your food shopping in Cape Coral an adventure by trying out locally grown produce, freshly caught Gulf seafood, and all manner of items at our specialty markets. While you're in Florida, you have to have fresh seafood at least once! Freshly picked fruits and veggies from the farmers market are much tastier than what you can find at the grocery store. Shopping outdoors in the middle of winter on a warm, sunny day for produce is even better! Expand your horizons with imported foods from Italy, and fine cuts of meat ........... and I bet you will find anything you need at Fleamasters Fleamarket. 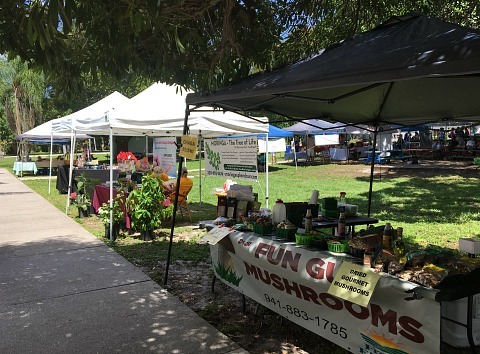 Make that special recipe with local fresh fruits and vegetables, shop for supplements and organic produce, you'll find all these specialty items at our Cape Coral markets. 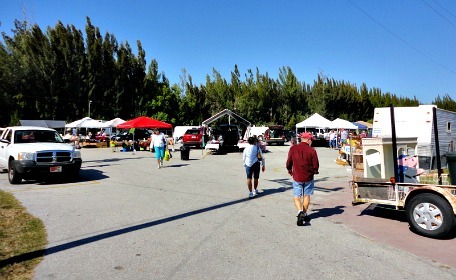 During the middle of October through the beginning of May, the Cape Coral Farmers Market is right off of Cape Coral Parkway, at Club Square, on SE 10th Place and SE 47th Terrace. 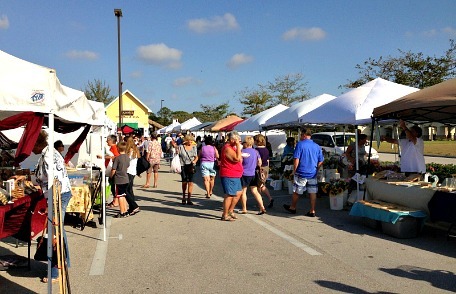 Put on by the Cape Coral Chamber of Commerce, the market is open every Saturday from 8AM - 1PM. Over 40 vendors sell local fruits and veggies, fresh seafood, artisan breads, smoothies, nuts, Wisconsin cheeses, and more. You can shop while listening to live music, entertainment, and community presentations. 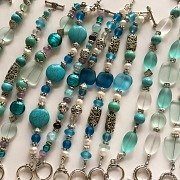 On the first and third Saturdays of the month, you will also find artists, craftsmen, and vendors from several states that sell everything from antiques, collectibles, gifts, arts and crafts, furniture, soaps and oils, clothing, florals, jewelry, fashion accessories, decor for home and garden, and much more. From May to October, the market moves over to Cape Harbour. They are open every Saturday from 8AM - Noon. Cape Harbour is located at the southern end of Chiquita Blvd and while you are there, you can enjoy a stroll around the marina and shops, or enjoy lunch at one of the restaurants. Also sponsored by the Chamber of Commerce is the newest of the Cape Coral markets. 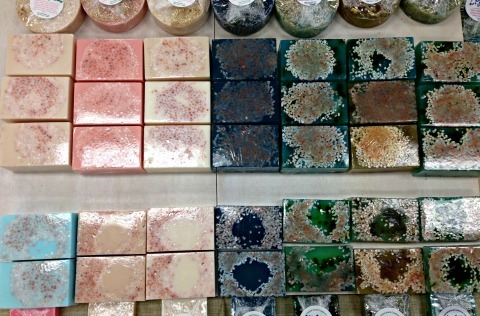 It's the Sunset Market at the Surfside Shops on the corner of Veterans and Surfside Blvds, every Tuesday from 1-6PM! 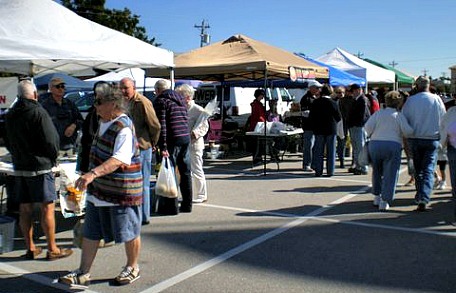 This farmer's market is set up outside in the plaza's parking lot from October - May during season. It moves inside to one of the shops in the plaza for the warmer months. UPDATE MAY 2018: The Tuesday market has lost its indoor space and will probably stay in its usual outdoor spot in the parking lot, but in the morning and run from 8AM - NOON or 1PM. I love this little market! This is where I like to buy my fruits and veggies, some of it is locally grown ........ the prices are lower than they are at Publix. You can also buy fresh seafood, grass-fed beef, herbs, honey, plants, clothing, bakery goodies, Italian food, crepes, and a whole lot more. 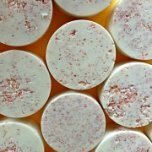 I sell my handmade soaps, salt scrubs, and body butters along with my handmade beach glass jewelry through my company Coastal Island Creations at this market and the Saturday one downtown during season! Just over the bridge from the Cape is the Alliance for the Arts Green Market. Shop for organic produce and handmade crafts under the banyan trees, listen to the live music, taste local treats. Can't go to Italy? 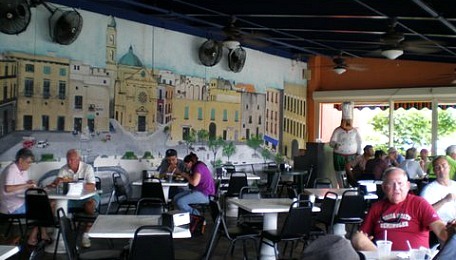 You don't have to, just go to Paesano's, where you can experience a little touch of the Old Country in Paradise! 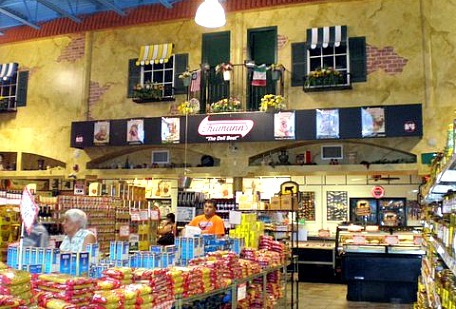 This Cape Coral market has Italian specialties and imports in a store decorated to look like you're actually in Italy. Pasta is stacked up high under clotheslines and walls painted with windows reminiscent of an old village. 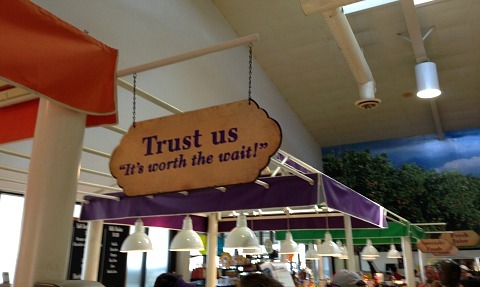 They have the highest quality freshly-cut meats and the best cold cuts. As a matter of fact, I have a neighbor who will only buy his meats here. You will also find local produce, which is delivered daily to make the perfect tomato sauce. Domestic and imported Italian specialty items, fine wines, and home made desserts are all waiting for you at Paesano's. Enjoy lunch at their outdoor cafe, where they serve sandwiches, salads, pizza, and other Italian dishes. 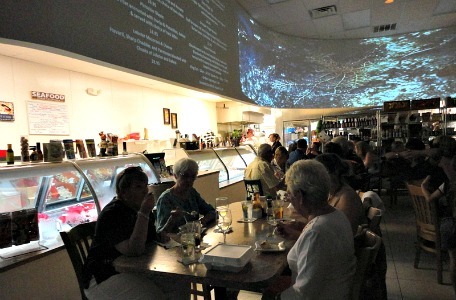 Go to Paesano's website for daily and weekly specials, catering and party information. 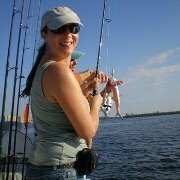 A list of Cape Coral markets wouldn't be complete without listing places to buy seafood, after all, we have some of the most fantastic fishing in our area of Southwest Florida. Merrick Seafood has been operating for over 20 years, selling the freshest seafood at both retail and wholesale levels. 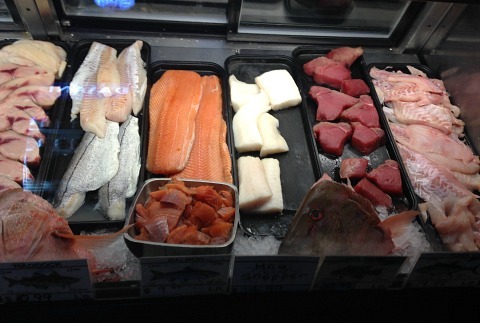 They sell the highest quality fish, shrimp, clams, crabs, and lobsters to area restaurants and for your dinner table. Merrick's also makes up platters, ready-to-bake entrees, and soups for your convenience for parties or family meals. Check their daily specials ........ Crabby Mondays, 2-for-1 Tuesdays on certain entrees, Lobster Wednesdays, and $5 Thursdays on certain entrees. 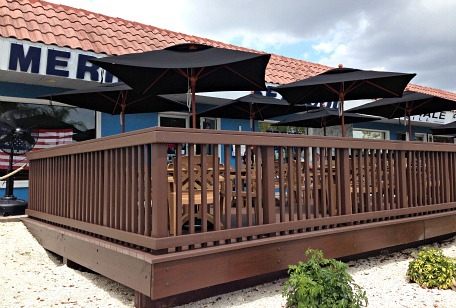 Merrick has opened up a new restaurant next to their market called Fish Tale Grill and is open for lunch and dinner. Fish Tale Grill serves seafood, pasta, soups, salads, and meat entrees Monday - Saturday from 11AM-9PM. Seating is available inside or outside on a new deck in front of the market and restaurant. The market is open Monday - Saturday 9AM-Closing, and Sunday 9AM - 5PM or Closing, please call ahead for Sunday's closing time. Cash and credit cards accepted. Lobster Lady is a seafood market and restaurant, and one of my most favorite places to go out to eat. The food is fabulous and you guessed it ..... they specialize in lobsters! 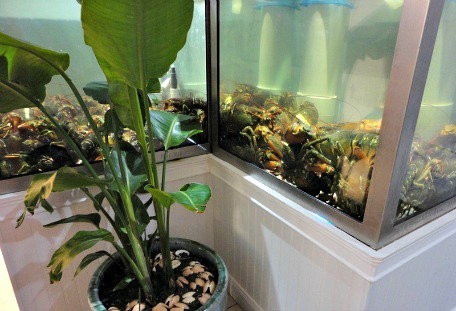 And they have tons of them in tanks along one wall of the market. Fresh Nova Scotia lobsters are flown in once or twice a day, Ipswich clams, New England scallops, grouper from Pine Island, and other seafood are delivered 6 days a week to ensure the finest quality for both restaurant and market patrons. This popular restaurant has both indoor and outdoor dining, and because they buy such a high volume of lobsters, you may be able to pay less for a lobster cooked to order than picking one up at the supermarket and cooking it yourself! From November - April, the German American Club has a flea market on their grounds every Thursday from 8AM-1PM. 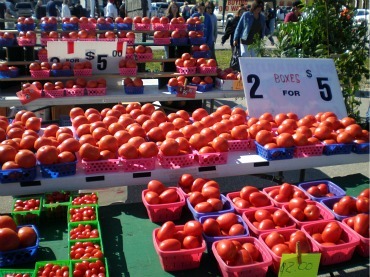 You'll find vendors that sell fresh produce, food items, clothing, jewelry, crafts, antiques, collectibles and more! 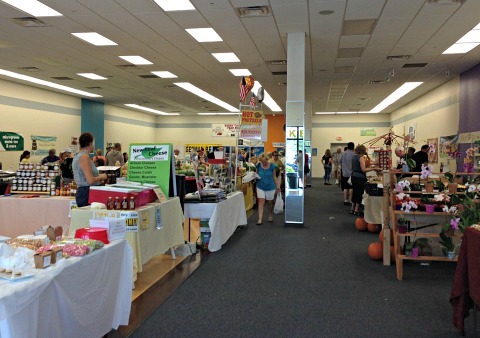 With over 900 vendors, one day may not be enough to see everything at Fleamasters. It's a great place to find souvenirs, clothing, accessories, home decor, antiques, and art. There's even a hair salon, a prescription eyewear store, and you'll usually find puppies and other pets for sale! 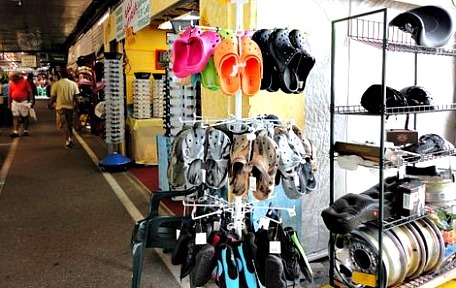 With plenty of food stands, fresh fruits and veggies, plants, a garage sale section, and live entertainment, you're bound to find something that catches your fancy ........... anybody need any crocs?! 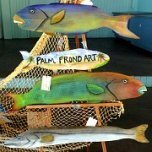 The Ft Myers fleamarket is open year round, from 9AM - 5PM, on Fridays, Saturdays, and Sundays. 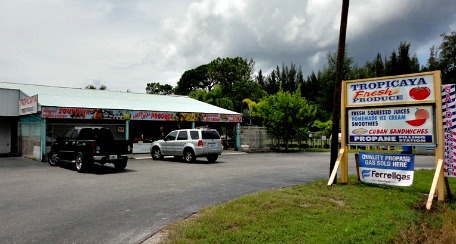 If you want to buy local fresh produce and don't want to wait for the weekend, you can go over to Tropicaya, on Pine Island Rd, just west of Burnt Store Rd. They have a pretty good selection of fruits and vegetables plus a shop where you can buy smoothies and freshly squeezed juices. 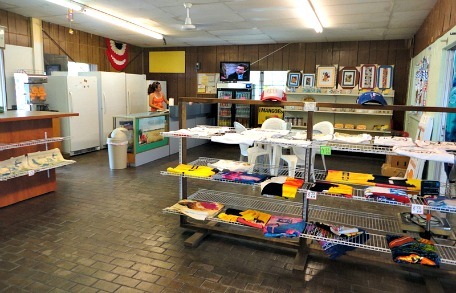 Tropicaya also has souvenirs, Cuban sandwiches, and other food items. 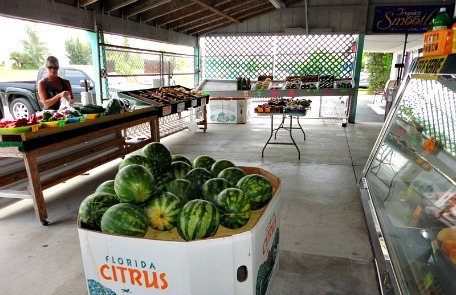 Stop by on your way back from Pine Island and Matlacha, your meals will taste better with fresh, locally-grown produce from one our outdoor Cape Coral markets! They are open Monday - Saturday from 9:30AM-5:30PM, and Sunday 10:30AM-5PM. 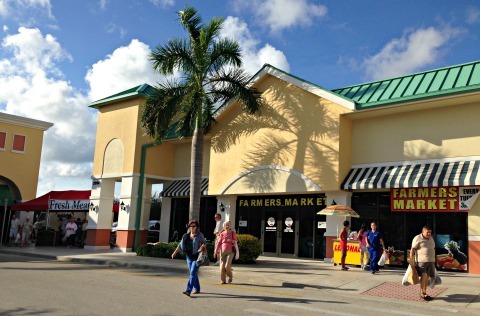 For more Cape Coral markets, we have 2 health food stores. I like both of them and I'll go to either one of them depending on if I'm heading towards Del Prado Blvd or Cape Coral Pkwy. 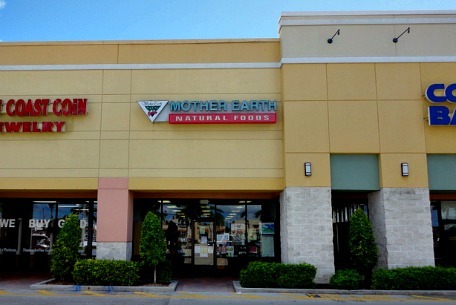 Mother Earth is at Coral Pointe Shopping Center on Del Prado, and they have the popular brands of vitamins and supplements as well as their own company brand. 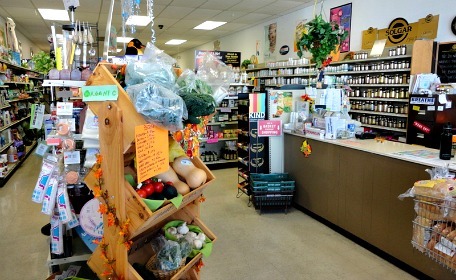 You'll also find food items; bulk bins of nuts, seeds and herbs; some organic produce, plus health and beauty products. They are open MWF 9AM-6PM, TuTh 9AM-6:30PM, Sat 9AM-5:30Pm, Sun 11AM-4PM. Back to Nature has more specialized brands of vitamins and supplements. 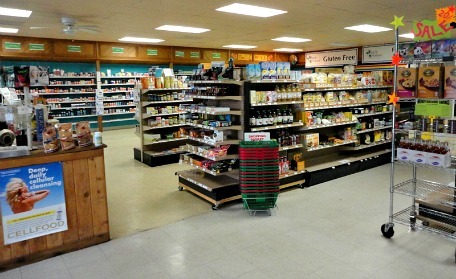 They also carry food items and a good selection of organic produce. 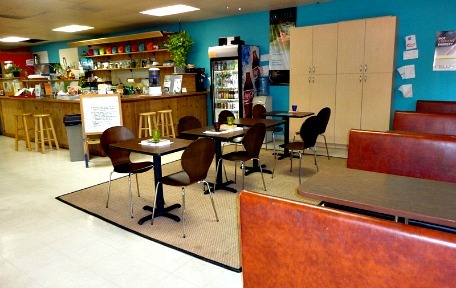 Enjoy a healthy snack at their juice and smoothie bar ........ or have one for lunch! We had one of the best smoothies we've ever had at Back to Nature. Beverages include fresh and organic fruit juices, tea, coffee, coconut, and organic or raw superfood smoothies. 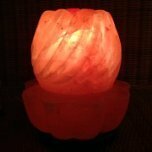 Sign up for their raw food classes, lectures, or use their massage and cleansing services. 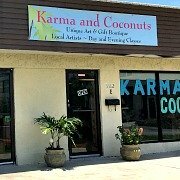 Everyone is friendly, knowledgeable, and helpful at both Cape Coral markets, feel free to ask questions about health problems ....... their advice comes from personal experiences, familiarity with the products they sell, and consultations with health books. 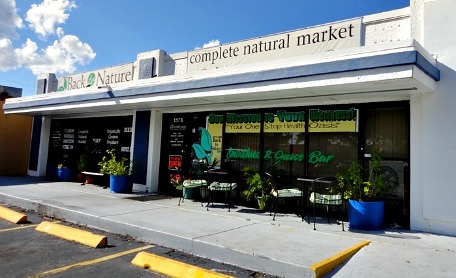 If you are interested in getting delivery of fresh, local, organic produce check out Organics of Naples Food Co-op. 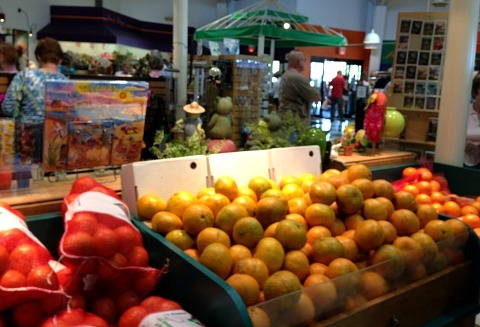 For a quick and fun thing to do, go to Sun Citrus Harvest in Ft Myers for fresh Florida-grown citrus fruit! 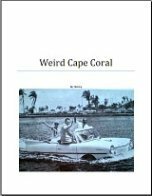 It's located on the corner of Six Mile Cypress and Metro Pkwys and is a family business that was started in 1940 in Vero Beach by the Edsall family. 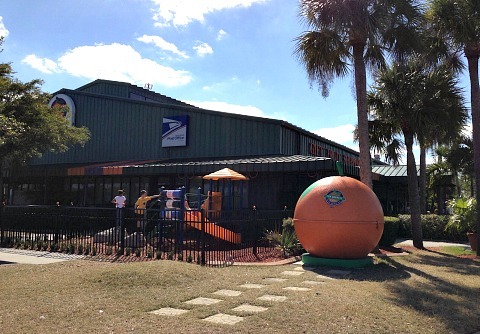 The Ft Myers packinghouse and retail store was opened in 1990 so you can buy the freshest Florida oranges, grapefruit, tangerines, and tangelos. You can also have the fruit shipped and can make the arrangements right here so you or loved ones up north can enjoy a "taste of Florida sunshine" during the winter and early spring months. 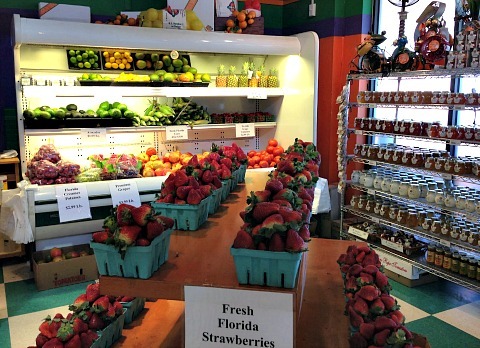 Also available for purchase directly from their store are key limes, peaches, and strawberries plus specialty foods such as jams, jellies, honey, salad dressings, gift baskets, souvenirs, toys, and snacks. 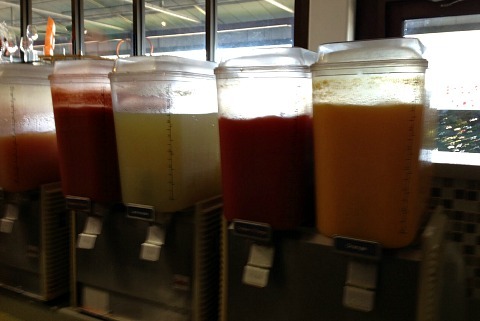 But that's not all, you can sample their amazing juices such as orange, cranberry orange, lemonade .......... and make sure you try the strawberry orange ......... it's the best juice I've ever had! Then buy a gallon or 2 to take home. Also very popular is their soft serve ice cream. 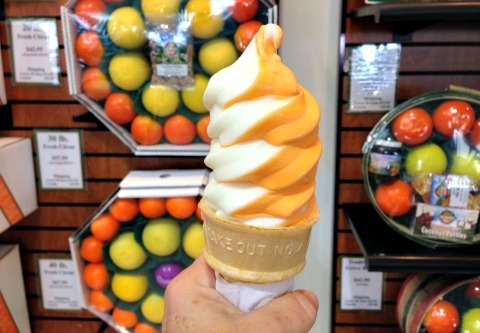 It's absolutely delicious and I recommend that you get the orange vanilla twist. Kids can play at the playground in front of the store while you shop. Think of Sun Citrus for Christmas shopping, get their convenient gift cards ..... you'll want them for yourself as well as for friends and family! Go to their website for more information and where you can print a Free Ice Cream coupon. They are open year-round Monday - Saturday from 8AM-7PM, and Sundays from 10AM-6PM ........ closed Easter, Thanksgiving, and Christmas.